Rebounding Barefoot: Should You Wear Shoes on a Rebounder? » Rebounding Barefoot: Should You Wear Shoes on a Rebounder? Shoes or no Shoes on a Rebounder? You may have just bought your very own mini-trampoline, but you are unsure about your choice of footwear. Depending on your health and preference, you may find that some choices don’t quite work for you. There is so much footwear made for rebounding exercise, but which one is the best? We are here to give you all the information you need to make a good choice. If you have a rebounder at home then you would want to go barefoot, because doing so will help you improve your balance faster. Your feet muscles will also grow stronger with time and it might feel more comfortable. Going barefoot usually lets you have a better grip on the rebounder and have more control. Shoes might feel like they are choking you and you would probably end with sweaty feet. Though, rebounding without shoes might cause your feet to feel more sore and you would have to take occasional breaks. You gain the best results by going without any footwear but it may not be ideal for all people. Now, if you don’t want to go without any footwear on your rebounder, then there are many options for you. What shoes are the best for rebounding though? We find crossfit shoes and running shoes the most comfortable for this type of workout. This type of shoes doesn’t damage the rebounder as much and they have enough traction on the soles so you don’t slip. They feel soft on your feet so you won’t strain them while exercising. Wearing shoes helps with pain in your ankles, your feet and they will provide more stability. If your feet are irritated by the rebounder or your have issues with your feet then you would probably want to skip going barefoot. Shoes will also help people with flat feet to keep balance while working out. Perhaps you aren’t the type to go barefoot or you find shoes feeling too clunky. You’d be surprised, but there are special socks for rebounder exercises! So, if you were thinking about jumping in regular socks on your mini trampoline, just forget about it. Ordinary socks are in no way a good idea since you can easily slip off and you might injure your ankles. However, grip socks will prevent you from sliding off the trampoline. Moreover, they keep your feet safe from the damage of jumping for long durations. Rebound exercise is a great way to improve your overall health. 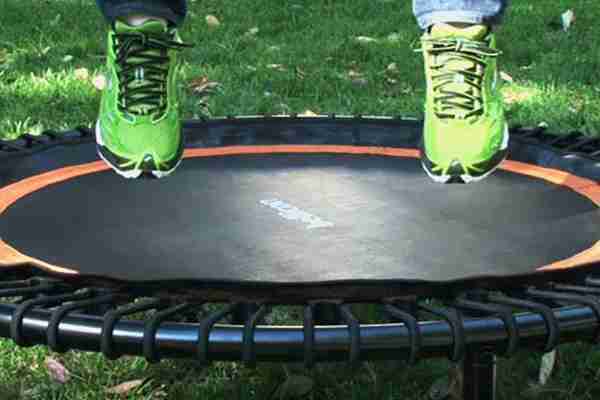 A rebounder is basically a mini-trampoline that you can use comfortably while indoors. This type of exercise is great for your immune system, your heart, and bones. While jumping on a rebounder, you are improving the lymphatic flow which helps the body flush out the toxins. This makes the lymph fluid circulate 10 times more than when you are sitting. By rebounding, you are also losing a good amount of weight and improving your metabolism. As most exercise, it helps with relieving stress and helps circulate oxygen through your body. Because of this, you are less likely to get sick. It also strengthens the heart, muscles, and cells all while increasing bone density and improving balance. Since it boosts your immune system and your body health overall, it’s been recommended to everyone, including cancer patients. The best defense the body has against cancer is the immune system. Seeing as chemotherapy has many negative side effects, exercising can improve your life and help you fight. Additionally, rebounding has been confirmed as an effective exercise by NASA in a study completed in 1980. The research found that rebounding is 68% more effective than jogging, as well as that it puts less pressure on the joints. Every person that wants to lead a healthy life should do rebounding and keep their body clean. Furthermore, a rebounder doesn’t take up much space, and it’s easy to set up. While there are many ways to exercise on your rebounder, what is the best option for you? You could also go barefoot or with grip socks. It usually comes down to comfort and personal preference. There are also different types of exercise you can do on your rebounder and you might find that you’d want to swap between shoes and going barefoot. Furthermore, if you have health issues with your feet, then shoes are a good option but they might limit the control of your movements. Crossfit and running shoes won’t damage your trampoline as much, though they are still harder than your bare feet. Socks are a good option since they are in between going barefoot and shoes, the only downside is that they end up soaked in sweat. Your workout will feel the best with whatever suits your taste and your feet.